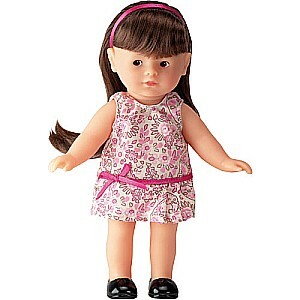 Corolle's petite Mademoiselle Corolle Mini Corolline Brunette Toddler Doll, with her sweet face and long, comb-able hair, is the perfect take-along playmate for girls ages 3 and up. 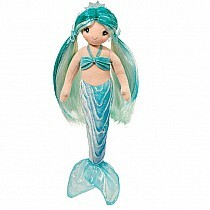 At 8 inches tall, she is the perfect size to tuck into a backpack or a pocket! This charming 8-inch toddler doll has silky long hair, brown painted eyes and a sweetly expressive face that will captivate any young girl 3 and up. Designed in France, this adorable pocket-sized playmate features high-quality materials and careful attention to detail. Her smooth vinyl skin is delicately scented with vanilla -- a Corolle signature. Corolle's Mademoiselle Corolle Mini Corolline Brunette Doll is the winner of a Platinum Seal Award from The Oppenheim Toy Portfolio, the only independent consumer review of children's media. Award winners are selected based on their quality, innovation, and ability to provide children with an engaging play experience. The Platinum Seal Award is The Oppenheim Toy Portfolio's highest honor.